To become a Premier School of Business and Entrepreneurship in making dynamic Management and Entrepreneurial Leaders with transformational skills through Quality Management Education for the development of society. To Mould the budding Management Professionals to be more intellectual, ethical, entrepreneurial innovative and competitive in the present and changing business environment. I. To practice their professions conforming to Innovative and Managerial Skills. II. To practice in problem solving and analytical attitude in international and multi disciplinary environments. IV. To successfully adapt to continuous attitude learning and stay current with their professions. k)	to employ the techniques, managerial skills and current trends of business for managerial practice. Dr. T.Jothimurugan and Dr.A.C.Kannan are the recognized supervisors for Ph.D Programmes of Anna University of Technology, Madurai. Innovative changes have become the order of the last decade of this millennium in all fields. Nationally as well as Internationally. Business is not an exception to it. Also it is a fact that the business world is changing at a tremendous pace, unknown ever before. To cope up with this rapid change of the business world, an urgent need of a large number of trained and talented managers, to lead every business organization to success has become very essential. It is in this background - to meet the local and global need of the industry - the management of K.L.N College of Engineering started the prestigious Master of Business Administration course in this backward area of Tamilnadu. Fully realizing the objective of the management the Department of Business Administration has taken all efforts to make the students two-year learning a really fruitful one. 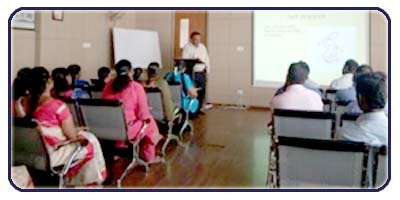 To make the learning process interesting and informative, class room lecturers are supplemented by the case studies, role plays, computer based management games and video / audio program on management. 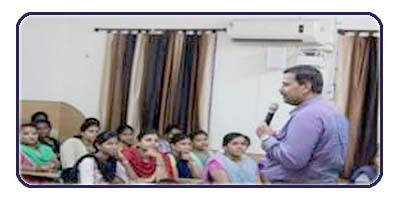 Group discussions, Industrial visits, seminars, interaction with practicing managers, and guest-lectures by experts on effective management techniques are regularly arranged. 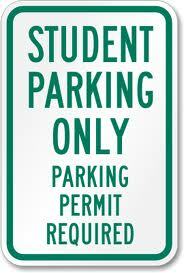 Students are very much encouraged, and guided to participate in inter - collegiate seminars on management. In addition to all these, worthwhile the final semester project is the important component of the M.B.A. course. Our students choose companies located in different states such as Kerala, Andhra Pradesh, Maharashtra, Assam and Tamil Nadu and in Foreign country for doing their project works. To get wider knowledge of current and practical changes happening in the business world, an association "GEMS" (Group of Emerging Executives in Management Studies) has been formed. Workshops, Guest Lectures by practicing executives, Industrial Visits, Seminars, etc., come under its agenda. 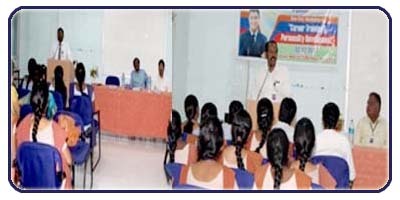 A SOFT SKILLS training program for Newly Recruited Postal Assistants of India Post at Postal Training Centre, Perungudi, Madurai on various topics include – Business Etiquette, Art of Personal Selling, Interpersonal Skills, Motivation, Stress Management and Communication from 06.04.2015 and 28.05.2015 Mr.S.N.R.Srikumar, Associate Professor was the coordinator for the above training program. 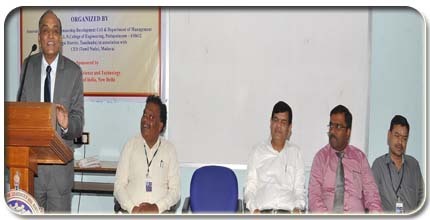 Department Faculty Members handled various sessions. A training program for Marketing Executives of India Post at Postal training center, Perungudi, Madurai on 24.11.2014 and 25.11.2014.Mr.S.N.R.Srikumar, Associate Professor was the coordinator for the above training program. 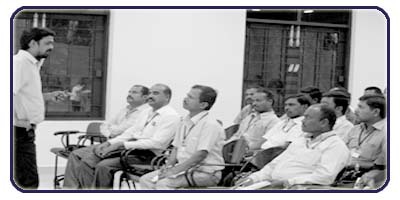 A training program for Marketing Executives of India Post at Postal training center, Perungudi, Madurai on 15.7.2014 and 16.7.2014.Mr.S.N.R.Srikumar, Associate Professor was the coordinator for the above training program. A training program on Retail Marketing for VAPS, Madurai an NGO sponsored by Ministry of Agriculture, Govt., of India and NABARD on 7.2.2014 and 5.3.2014.Dr.T.Jothimurugan and Mr.T.C.Suriyanarayana Prabhu were the coordinators for the above training program. Mr. S.N.R.Srikumar, Project Coordinator and Assistant Professor – MBA, KLNCE is handing over the Report to Mr. Edwin – Head Operations, Grassland Agri Ltd.
Won I Prize for Ad- Zap participated at Jamal College of Engineering, Trichy on Oct 2016. S.Aishwarya – II MBA student has managed to secure 26th rank in the Anna University April / May 2016 Examinations. Ms.AISHWARYA OF II MBA RECEIVING INTERNSHIP CERTIFICATE OF GOVERNMENT OF INDIA, MINISTRY OF FINANCE, NEW DELHI FROM OUR PRINCIPAL. MBA Student(2014-2016 Batch) - Ms.Razia Sulthana has been permitted to do One Day Internship Program on 24.03.2015 at HATSUN AGRO PRODUCT LIMITED, Madurai. at Lady Doak College, Madurai. Global Impact on Banking Sector State Level conference on “Impact of Global Meltdown in Indian Economy”, Nadar Saraswathi College of Arts and Science, Theni. Greening Food Processing Sector for Sustainable Safe Food Supply International Conference on Food Technology at Indian Institute of Crop Processing Technology, Thanjavur. Bridging the theory and Practices of Marketing National Conference Vidyapoorna on “Classroom to Corporate – Bridging the Gap” at SSK College of Engineering & Technology, Coimbatore. Paper Presentation on CSR Gandhi Gram University. Over all Events Sourashtra College. Kannan Devan Tea Estate, Munnar. Served as Resource Person for a One day Workshop on “Optimal use of E-Resources” at Thassim Beevi Abdul Kader College for Women, Kilakari, Ramnathapuram Dist. Mr.T.S.Ramkumar serves as Faculty Advisor for Online Certification Level-1 Course on Entrepreneurship Development for the period January 2017 to July 2017conducted by EDI, Chennai, Tamilnadu Government. Mr.T.S.Ramkumar chaired as Judge for KAIZEN 2017 conducted by QCFI, Madurai Chapter on 22/07/2017. Dr.T.Jothimurugan delivered an expert talk at EAP on “MSMEs & Its Roles” for KLNCE Engg and MBA Students on 30.03.2017. Mrs.B.Shanthi delivered a lecture at EAP on “Financial Statements For MSMEs” for KLNCE Engg and MBA Students on 30.03.2017. Dr.T.Jothimurugan been selected as Expert Member in Selection Committee Meeting of Innovative Project proposals submitted to MSME – DI on 18.03.2017 at IIPC Cell. Mr.T.C.Suriyanarayana Prabhu handled a training session on “Personality Enhancement: Confidence Building & Public Speaking – Effective Public Speaking” at VAPS, Madurai on 10.03.2017. Mr.K.S.Hariharan handled a training session on “Personality Enhancement: Business Skills” at VAPS, Madurai on 08.03.2017. Mrs.B.Shanthi attended one day workshop on “The Essential Traits of Teaching Methodology” conducted by Staff Development Cell, KLNCE on 06.09.2016. 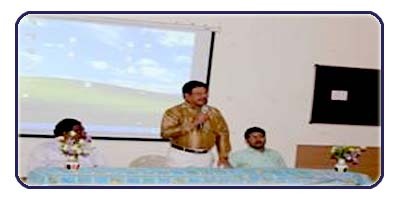 Mr.T.C.SuriyanarayanaPrabhu handled a training session on “Personality Enhancement: Communication Skills – Effective Public Speaking” at VAPS, Madurai on 02.05.2016. Mr.T.C.SuriyanarayanaPrabhu handled a training session on “Personality Enhancement: Goal Setting” at VAPS, Madurai on 03.05.2016. Dr.T.Jothimurugan handled a Training session on “Risk & Crisis Management” at VAPS, Madurai on 30/04/2016. Mr.T.C.Suriyanarayana Prabhu – AP MBA handled a training session on “Personality Enhancement-Time Management-Confidence building - Exercise” for Agripreneurs organized by VAPS, Madurai. On 27.01.2016. Mr.T.C.Suriyanarayana Prabhu – AP MBA handled a training session on “Personality Enhancement-Time Management-Confidence building - Exercise” for Agropreneurs organized by VAPS, Madurai. on 27.01.2016. 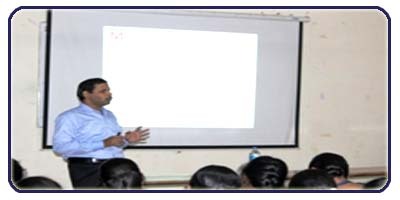 Dr.T.Jothimurugan, Director – MBA delivered a special lecture on “Marketing” on 05.01.2016 at Entrepreneurship Development Institute – EDI – Government of Tamilnadu, MADITSSIA, Madurai. ■ Dr.T.Jothimurugan has been offered and honoured to be the Member in Board of Studies of the Faculty of Management Science, Anna University Chennai for a period of three years upto February 2019. 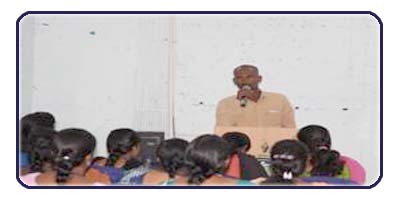 ■ Mr.T.C.Suriyanarayana Prabhu – AP MBA delivered a special lecture on “SOFT SKILLS” at Department of Economics, YADAVA COLLEGE, Govindarajan Campus, Madurai on 31.03.2016. ■ Handle a training session on “Business Plan Preparation” on 30.03.2016 at entrepreneurship awareness camp organized by entrepreneurship development cell and Department of Management Studies in association with Centre for Entrepreneurship Development funded by DST, New Delhi. 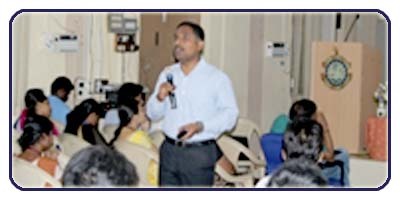 ■ Dr.T.Jothimurugan, Director – MBA delivered a lecture on “Personality Enhancement – Risk/Crisis Management – Case Studies” on 29.02.2016 at VAPS – Training Institute, Madurai. ■ Mr.T.C.Suriyanarayana Prabhu – AP MBA handled a training session on “Personality Enhancement-Time Management-Confidence building - Exercise” for Agropreneurs organized by VAPS, Madurai. On 27.01.2016. Mr.T.C.Suriyanarayana Prabhu – AP (Sr. Gr) – handled a training session on “Personality Enhancement – ICE Breaking Session –Exercise” at VAPS, Madurai on 09.09.2015. Mr.T.C.Suriyanarayana Prabhu – AP (Sr. Gr) – handled a training session on “Tips to Agripreneurs – Ice Breaking Session” at VAPS, Madurai on 02.09.2015. Our Department has signed a Memorandum of Understanding with Confederation of Indian Industry – Yuva Young Indians – Madurai Chapter on 29.07.2015. 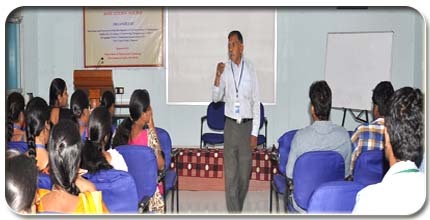 Dr.T.Jothimurugan – Director – MBA – handled a training session on “Personality Enhancement – Risk / Crisis Management – Case Studies” at VAPS, Madurai on 09.07.2015. 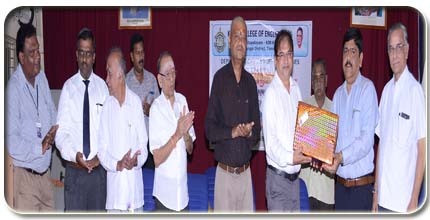 •	Dr.T.Jothimurugan, Director – MBA, attended the Board of Studies in Business Administration, Lady Doak college, Madurai on 25th February 2015. •	Dr.T.Jothimurugan, Director – MBA, handled a training session on “Project Appraisal – Technical & Financial” at Training on Training of Trainer Programme (TOT) organized by VAPS, Madurai on 20.02.2015. •	Mr.T.C.Suriyanarayana Prabhu – AP (Sr. Gr) – handled a training session on “Personality Enhancement – Time Management – Confidence Building – Exercise” at VAPS, Madurai on 12.01.2015. •	Mr.T.C.Suriyanarayana Prabhu – AP (Sr. Gr) – handled a training session on “Entrepreneurship laboratory & motivation - Exercise” at Training on Training of Trainer Programme (TOT) organized by VAPS, Madurai on 09.02.2015. •	Mr.T.C.Suriyanarayana Prabhu – AP (Sr. Gr) – handled a training session on “TIPS for Agripreneur – ICE Breaking Session” at VAPS, Madurai on 16.03.2015. •	Dr.T.Jothimurugan, Director-MBA conducted a specialized training programme for Farm and allied Graduates/Diploma Holders at VAPS, Madurai. •	Dr.T.Jothimurugan, Director-MBA act as a Judge in the event JUST-A-MINUTE at VYUHAM’14 organized by MCA Department. 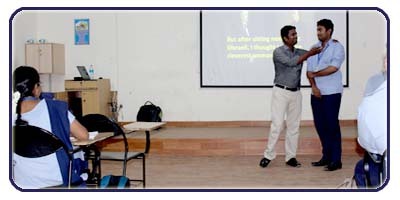 •	Dr.T.Jothimurugan conducted training on Personality Enchancement – Risk/Crisis Management – Case Studies at VAPS Training Institute on 27/06/2014. 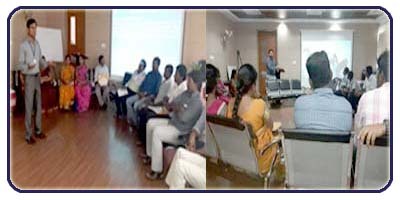 •	Dr.T.Jothimurugan conducted training on Management and Soft skills for India Post employees at Postal Training Centre on 05/04/2014 and 12/05/2014. •	Dr. T. Jothimurugan, Director – MBA, acted as Guest Lecture resource person on “Risk & Crisis Management” at VAPS, division sponsored by NABARD & Ministry of Agriculture on 03.12.13 & 18.10.13. •	Dr. T. Jothimurugan, Director – MBA, appointed as a Board of Studies members in Buisness Administration in Lady Doak College, S.V.N. College, American College in December 2013 to 2015. •	Mr. R.S. 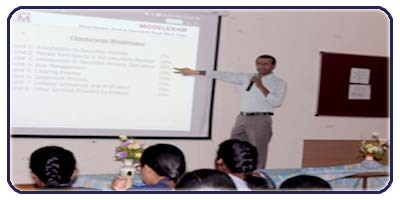 Balasenthil – ASP – MBA, acted as a Resource Person for the Applications of SPSS FDP on “Research Methodology for Management Researchers” organised by the Department of Management Studies, Nehru Institute of Technology, Coimbatore. •	Mr. K.S. Hariharan – AP – MBA, acted as a Resource Person on “ ESDP Training Program – on Personality” at VAPS, division sponsored by NABARD & Ministry of Agriculture on 21.11.2013. FDP on “Data Analysis in Research – Using SPSS” was by Department of Management Studies, KLNCE for the faculties and research scholars from various colleges in Tamilnadu on 27.10.2010. Mr. R.S. Balasenthil, Associate Professor – MBA acted as a resource person. 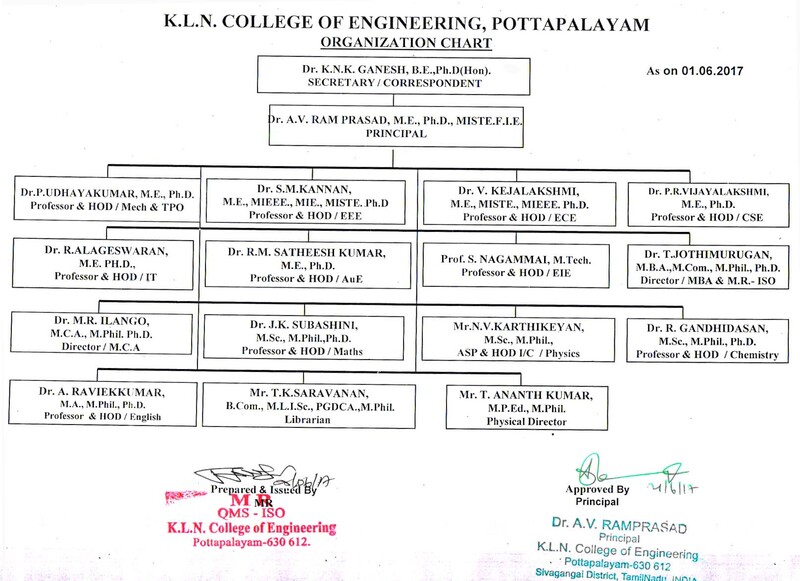 Dr.T.Jothimurugan, Mr. T.C.Suriyanarayanaprabhu and Mr.V.S.Harshith Babu acted as co-ordinators. Mrs. A.C. Anbudevi, Assistant Professor – MBA acted as a resource person in FDP on “Managerial Skills” for the topic Leadership Traits organized by Training and Placement cell for the senior staff members of K.L.N College of Information Technology on 10.01.2011. 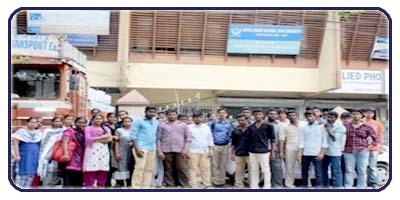 Mr. V.S.Harshith Babu, Assistant Professor – MBA acted as a resource person in FDP on “Managerial Skills” for the topic Achievement Motivation organized by Training and Placement cell for the senior staff members of K.L.N College of Information Technology on 10.01.2011. 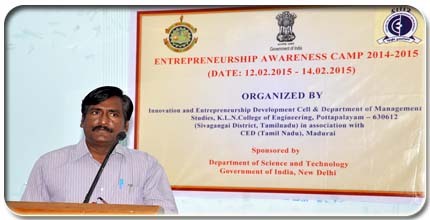 Mr. S.N.R Srikumar, Associate Professor – MBA organized and coordinated Entrepreneur Awareness Programme (EAP) jointly with TACED (Tamilnadu Council for Enterprise Development) between 20.01.2011 to 23.01.2011 at KLNCE. 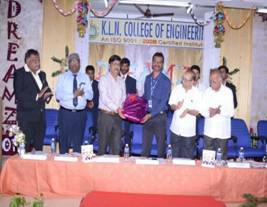 60 Pre-final year Engineering students of KLNCE were benefited attending the above EAP. 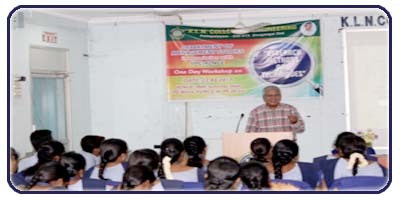 Mr. S.N.R Srikumar, Associate Professor – MBA organized and coordinated Soft Skill training programme for frontline staff of Department of POST(INDIA-POST) on 20.02.2011 and 27.02.2011 at KLNCE. 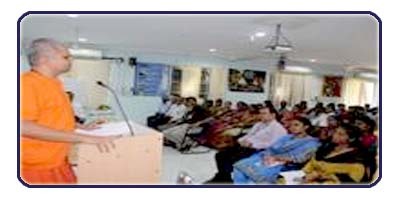 229 Postal officials were trained on Soft Skills. Mr. S.N.R Srikumar, Associate Professor – MBA has been invited by the director, postal training centre to engage induction course for newly recruited candidates in the department of post for 55 days on soft skill from January to March 2011 at postal training centre, Madurai. Dr. T. Jothimurugan, Director – MBA acted as a resource person in the short term training programme on 05.02.2011 on Risk and Crisis Management organized by VAPS, NGO sponsored by Ministry of Agriculture and NABARD. a) The MBA department has produced 100% pass in Three subjects in the Anna university examinations. Two subjects in 4th trimester and one subject in 1st Trimester. Mr. S.N.R. 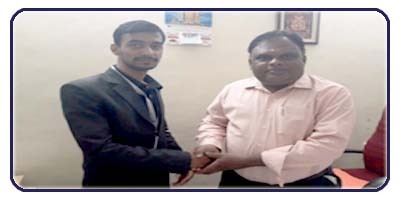 SRIKUMAR,Asst Prof, Mr. R.S. BALASENTHIL, SGL, Mr. B.PALANIVELRAJAN, Lecturer Mr.T.C.SURIYANARAYANAPRABHU, Lecturer, were the faculty handling these papers. b) Dr.T.Jothimurugan, Mr.S.N.R.Srikumar of MBA Department conducted a Career development lecture for the final year students of UG course at KLNCE. PUBLISHED IN INTERNATIONAL CONFERENCE ON INNOVATION MANAGEMENT (IM 2015), ANNA UNIVERSITY, BIT CAMPUS, TIRUCHIRAPPALLI. 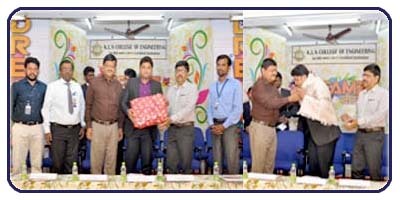 2 Students of II Year MBA presented research papers at Fifth National Conference on “Managing Challenges in the Digital Age” sponsored by PSNA College of Engineering and Technology and Dindigul Management Association organised by Department of Management Studies, PSNA College of Engineering and Technology on 21.04.2017. ANNA UNIVERSITY, BIT CAMPUS, TIRUCHIRAPPALLI. 3 students from II MBA attended a learning session on Suguna’s Success Story at Poppys Hotel, Madurai organized by CII – YUVA Young Indians Madurai chapter on 11.08.2015. NSIM - MARKETS Mr.A.RAMKUMAR Managing Director, Akshaya Investments. Role of ECGC in Export and Import Mr.B.SelvaRaj / Branch Manager. 08.02.2016 Awareness Programme on Equity Market Mr.S.Pravin, Branch Manager, Cholamandalam Security Limited, Madurai. Special events / Guest Lecture attended by the staff and also number of staff participated in short-term courses / seminar / FDP / workshop. Number of papers presented in National / International Conferences / National / International Journals by staff including National level / State level symposium. including National level / State level symposium. Talent Meet for Undergraduate Students from other Colleges. 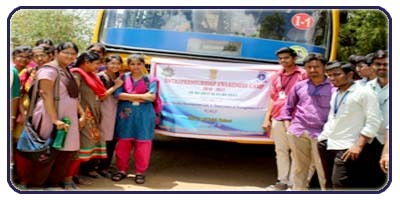 ENTREPRENEURSHIP AWARENESS CAMP SPONSORED BY DEPARTMENT OF SCIENCE AND TECHNOLOGY, GOVERNMENT OF INDIA, NEW DELHI, IN ASSOCIATION WITH CED (TAMILNADU), MADURAI. No. of. Participants (External / Internal) No. of paper Reg..
One Day Workshop on "NISM - Securities Market"
Academic year 2012 - 2013 Details of the short-term courses / FDP / Conferences / Seminar /Guest Lecture conducted by the department. 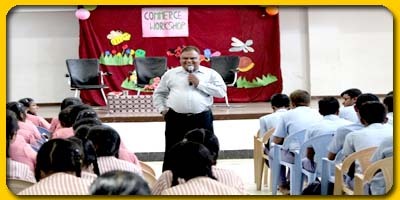 Mr. G. Karthickrajan, Branch Manager, ICICI Securities Ltd., K.K. Nagar, Madurai-20. 26.12.2012 A Wrokshop on " Investment in Capital Market Securities"
Mr. S. Palaniappan, Legal Advisor, Meenakshi Mission Hospital & Research Centre. Dr. R.R. Rajamohan, Prof&Head, Depeartment of Management Studie, Meenakshi Colleg of Engineering, Chennai -78. 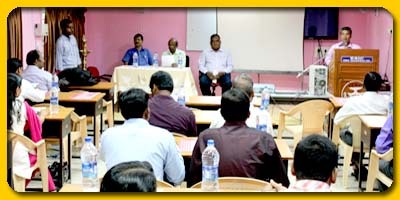 Department of Management Studies organized CEO Connect Meet on 30-03-2011 at PG Conference hall jointly with CII Madurai zone. 200 students representing various colleges around Madurai participated and got benefited. 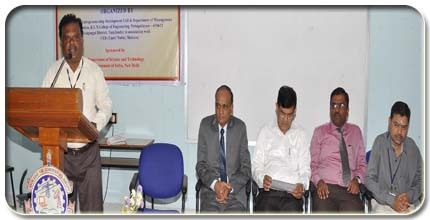 Department of Management Studies had organized three days Entrepreneur Awareness Programme (EAP) between 20-23 January 2011 for Engineering Students. 60 Engineering Students representing UG Engineering branches attended. 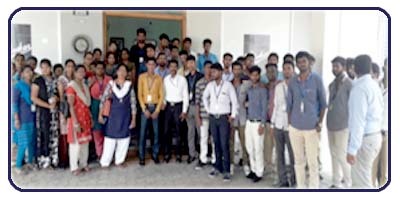 This EAP was organized by KITCO LTD Chennai, sponsored by National Science and Technology, Entrepreneurship Development Board (NSTEDB), Department of Science and Technology, Government of India and TACED Madurai. Mr.Mayathevar GM, DIC, Mr.Kannappan (SIDISSIA), Mr.Asokan, Nodal Officer KVIC and Other Eminent Resource Persons addressed the gathering. Mr.Jeyakumar Consultant TACED and Mr.S.N.R.Srikumar Associate Professor-1, MBA Department Coordinated this III days EAP Programme. Mr. Anandaraj, Lecturer, Kurinji Enginereing College, Manapari. Dr.N.Namasivayam, Director-MBA, St.Micheal College of Engg & Tech Kalayarkoil. Mr. Pradeep, Probit Consultancy, Chennai. Dr. Ruppa K.Thulasiram,Professor of University of Manitoba,Canada. Reader, Dept of Business Administration, SVN College, Madurai. Mr. FarookRahman, Senior Process Associate,INautic Technologies Ltd, Chennai. Department of Management Studies, Madurai Kamarj University. “Community Development Programme on Computer Training for Students” of Govt school, Samanatham Participants - 20 Mr.K.R.Gopalakrishnan, MBA Dept. 8005117 A COURSE IN DIRTRIBUTION THEORY AND APPLICATIONS 2003 CAREY DENNIS & CAROLINE MARIE CRC PRESS Inside . A294 A Study on Market Research in financial derivates-Ashok Leyland Finance Ltd., . Alwin Jacob ANNA UNIVERSITY Inside . 8005772 1001 FINANCIAL WORDS: YOU NEED TO KNOW 2003 BACH,DAVID MCKEAN, ERIN OXFORD UNIVERSITY PRESS Inside . 8005668 101 WAYS TO ADVERTISE YOUR BUSINESS 2007 GRIFFITHS ANDREW ALLEN & ULWIN Inside . 8005667 12 STEPS TO OVERCOME ANXIETY 2006 BEEKFIELD DENISE F JAICO PUBLICATION HOUSE Inside .